Tom Cavanagh's voice for when Harry Wells is possessed by Grodd isn't intimidating. The green-screen work during Barry's "I will not kill him" speech looks a bit off. Watching Violett Beane and Keiynan Lonsdale play off of each other is the best part of the episode. The art design on Gorilla City is fantastic. The CGI for the gorillas is top-notch. First appearing in The Flash #106 (April/May 1959), Gorilla City was a technological Utopian society society founded by super-intelligent, telepathic gorillas, who were enhanced by a meteorite. In the original comics, Grodd was originally a rogue member of this society. Solovar also first appeared in The Flash #106. The progressive leader of the Gorilla City gorillas in the comics, Solovar was respected for his wisdom and his impressive psychic powers. He weathered several attempts by Grodd to overthrow him and usurp control of his people. Julian lies to Captain Singh, telling him that he and Barry are going to a morphology conference in Bludhaven. In the DC Comics Universe, Bludhaven is a city near Gotham City which was patrolled by the vigilante Nightwing. Jesse says that she and her father took a week to translate a mathematical cryptogram that was sent to their STAR Labs on Earth Two. Barry: Harry's my friend. I'm not just going to abandon him. I'm going back to Earth Two. Cisco: And I suppose you'll want somebody to come with you who is going to open those breaches for you? Barry: We had... so much fun last time! Julian: Grodd? The telepathic gorilla? Julian: Where are you going? Are you going to the Planet of the Apes?! Barry: No, it's just a city of them. Jesse: When I first got my power, you were so lost not having yours. And I thought maybe part of the reason you liked me was...you were attracted to speed and not me. Jesse: I know! I know, okay? But... I saw you out there today! Being Kid Flash? You were complete Wally. You were scary complete. Wally: I could have all the speed in the world. I'm not complete without you. Barry: Solovar never wanted to attack Central City. You do. Grodd: You took my home away from me and now I will take it back! The gorillas saw what you did, Flash. They saw you defeat Solovar and now they are afraid of humans and will do anything I order. And I will order them to invade your Earth and your city will burn! Barry: You were planning this the whole time. Grodd: Yes. Father taught me well. Always think ahead. Julian: He's right. Cisco's death would change the newspaper headline in the future. Caitlin: It's a long story. Caitlin: You want -me- to kill him? Cisco: Think about it. Grodd doesn't know you have cold powers. You might be able to use them. Harry: Cold powers? (To Caitlin) You have cold powers? (in revelation, to Cisco) I knew it! I knew that you and I did not get Barry out of that mirror! Julian: Wait! Caitlin! If you kill someone, there's no going back. You'll be Killer Frost for the rest of your life. Now, I did not come all this way to see that happen! Caitlin: (incredulous) Did you come here because you "live for danger" or to protect me? Julian: (putting his emotionless mask back on) I just don't want to see you become something you're not. HR: When it comes to love. you've got to go for it! You know? Everything else be damned. Because if you don't, you're gonna end up being the kind of person that lives the rest of their life with regret. And I know that telling your dad that you're switching Earths - that's got to be a difficult conversation to have, but one that you've got to go for if you want to be happy. But - you know - that's just my opinion. What do I know? I'm just a handsomer guy than your dad, with a song in his heart. Good luck, Jesse. Grodd was last seen in 207 just after being sent through a breach to Earth Two to a sanctuary that Harry Wells said was set up for gorillas who had been mistreated by scientists. Harry Wells also noted that there were talking gorillas on Earth Two. Barry refers to the news crawl from 310 and the text "City Still Recovering From Gorilla Attack". Jesse finds out Wally is a speedster now. The Africa of Earth Two (or, at least, the part where Gorilla City is located) is not hot and has vegetation more consistent with a temperate forest than a tropical jungle. 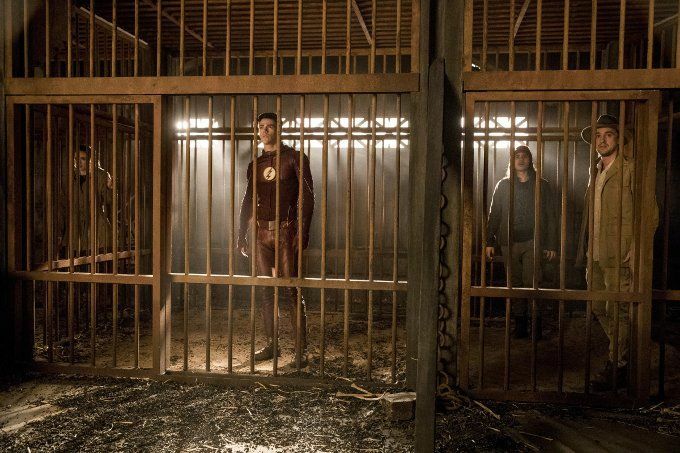 Grodd is somehow able to repress the powers of Team Flash while they are imprisoned. It is unclear if he is doing this telepathically or if it is a property of the cages. The Indiana Jones movies apparently exist on Earth Two. Harry refers to the events of 304 and how they used extreme cold to free Barry from a mirror but it wasn't enough and Caitlin had to finish the job, secretly, with her powers. Jesse decides to move to Earth One. She and Wally seem to officially become a couple. Julian asks Caitlin out to dinner. The final scene show Grodd assembling his armies, talking to Gypsy (or some version of her), telling her that she will open the breaches for him. Gorilla City on Earth Two. How exactly Gypsy winds up under Grodd's control in the final scene. Serviceable but not the slam-dunk one expected from the advertising. The Grodd plot is predictable and most of the cast is given little to do but sit in a jail cell and worry for most of the episode. Given the high-end Silver Age concept, the script is surprisingly joyless and it's Julian of all people who makes the inevitable references to Planet of the Apes. At least the production values are top-notch but the whole episode seems oddly lifeless.